Although karate was born in Okinawa and was influenced a lot by Chinese martial arts, we can say that “Shōtōkan Karate” has evolved both technically and spiritually to a 100%, Japanese art/sport. Its philosophy is based on the traditional “Budō” spirit of Japan. Like kendō, judō, aikidō, etc…. The ultimate goal is the perfection of character through hard training and discipline. When interacting with others, “rei” (bowing) serves as a means of initially displaying respect for a person’s character, contributes to well-balanced relationships between people and provides a way for preserving social order. “Setsu” (principles) represent the proper etiquette for expressing this concept. It is essential that those who practise karate maintain a deep natural understanding of “rei” and act in strict accordance to the code of “setsu”. SKIF karate seeks for the healthy mental and physical growth of youth and peaceful international exchange through training and tournaments. Executed by standing firmly with a balanced posture, kihon-waza is performed without deviating from the correct movements. Training encompasses: tachigata (stances), keriwaza (kicks), tsukiwaza (thrusts), atemiwaza (smashes), ukewaza (blocks). These kihon techniques can be done from a stationary position (sonoba-kihon) or moving in all directions (ido-kihon). As since ancient times it was not always possible to train with a partner, individual practise methods were developed in the form of “kata”. It has always been a typical oriental method of teaching the techniques and even secrets to the next generation of students. Five heian kata, three tekki kata, bassai-dai, kanku-dai, jion, enpi, jitte, gankaku, and hangetsu. Another eleven kata that were brought in the Shōtōkan karate system by senior students of Funakoshi Ō Sensei. Bassai-shō, kanku-shō, ji’in, chinte, wankan, unsu, gojushihō-dai, gojushihō-shō, meikyō, nijushihō, Sōchin. These fifteen + eleven kata are the “Shōtōkan” kata. Seienchin, sepai, koryu gankaku (gankaku-shō), nijuhachi. 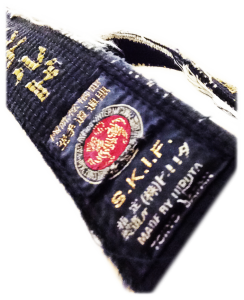 These kata are to be studied by the senior students or instructors of SKIF. Executing techniques of offence and defence with a partner. An in-bound rule exists in which practitioners must always maintain self-control regardless of what happens in the exchange of techniques and refrain from becoming emotional or seeking to hurt the opponent. This is part of the basic philosophy of karate-dō. Most people think kumite is “free sparring”, but there are many kinds of kumite. Free sparring is just one of them. Kanazawa Soke devised a comprensive kumite syllabus that is used during the training. Each kind of kumite has a different purpose, so practising all of them regularly is very important. Yakusoku kumite (promise(d) sparring, meaning that the attack is announced or known to the defender). Training in karate-dō is sometimes hard and the goals are not always clear. Perseverance and hard work allow the practitioner to push their physical and mental boundaries and nurture a sence of mutual respect and consideration for the feelings of others. Karate-dō, as a form of “human education”, promotes discipline and character development. This is what makes karate a “Dō” or a “Way” of life for the practitioner. It can be studied by all people of all ages. The goal of karate-dō, as with other budō arts, is not to beat the opponent to satisfy one’s own ego, but to overcome one’s own shortcomings and to live in “harmony” with oneself and others.